Buying a beach front home or condo in Miami-Dade County, Florida sounds like you have hit the sweet spot in life, right? That is until you realize that climate change is real and sea-level rise will cause you many problems in the coming years. First it starts with flooding during high tide then you notice that those areas are ponding or always has standing water. Then you can’t remember where those spots were because the water has inched its way well past that point. You now live in an area where it is difficult to insure your cars and you are constantly having to remove water from the first floor because high tide is at your door. What can you do? In Miami-Dade County and areas of Southern Florida high-ground has become a hot commodity. It seems like a responsible idea as a land and homeowner until you look at where higher-ground is located. Lets take a look back. It has always been the popular thing to go down to the beach and buy beach front property. It has the best view and shows the wealthy status of the owner. This was once a privilege only given to whites in Florida. Jim Crow laws shaped who could own beachfront property and live in beachfront communities. These laws restricted black and brown people to the urban core of Miami until the mid-1960’s. I don’t want this to seem like a Florida problem. Traditionally speaking the poorer members of communities have been restricted to low-lying cheaper plots of land. More specifically in the Miami area this forced people of color and immigrants away from the immediate coastal areas and onto a ridge of limestone that runs down the eastern coast of South Florida. This area by nature is higher in elevation than being right on the beach. Ironic how in hindsight those divisions created by the Jim Crow laws are biting back. Now comes the switch up. Climate change is happening and and the sea has risen 3.5 inches in the last decade in South Florida. After Hurricane Andrew in 1992 175,000 people fled the area but those that stayed are now looking for higher-ground. These middle-income families are now finding their way into those historically black and immigrant communities and pushing those lower-income families out. It doesn’t seem to be that big of a deal when you have the migration occurring one household at a time. The big problem is that now developers are recognizing higher ground as a hot commodity and in turn they are buying it up at an accelerated pace. These developers have turned their sites on communities like Little Haiti and the surrounding areas. Over a year ago a Chinese shell company purchased the Little Farm Trailer Park. Residents of the mobile home community with over 100 trailers just a few blocks from Little Haiti were told they were being evicted. They were offered between $1,500 and $2,500 to vacate their homes. This mobile home community offered these residents a place to live with rent of $500 a month. Where will they go for that rate in such a wealthy county? This is the very essence of gentrification. The Atlantic publication spoke with a writer living in the area. He owns business and homes in the Little Haiti area. He continuously spends money on repairing his homes and making sure that they look the best and meet code. He believes that he is constantly being fined as a future means of eminent domain by the government because this has happened in the past in Miami-Dade County. Historically land has been acquired from the poorer blacks through eminent domain proceedings for thing such as the expansion of I-95. During my research for this post I came across a couple articles disputing gentrification in Miami. Even if it is not happening now, how long before every bit of it is true? My concern is that this will not only happen to people of color or the immigrant communities. This will be happening all up and down the coastline across the country. 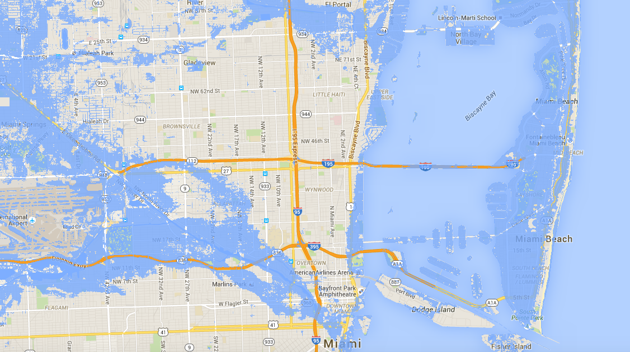 The sea-level is rising along all 95,471 miles of the U.S. shoreline. The University of Georgia published a study saying 3 million people in the U.S. will be displaced by seal-level rise by 2100. This begs the question of where will climate change refugees go? I fully expect to see ads on tv from Midwest states advertising communities accepting and welcoming climate change refugees. This will change the face of the country and it will change the face of the world. Every country that is not landlocked should start thinking and planning for the displaced population. We can prepare with proper infrastructure and planning or we can plan to entertain an extremely large homeless population. Dear T, nice to see your effort. This is a great start. If you wish to know how to make it twice as good, N knows how to get ahold of me, and glad to gift you time, as there are clearly some things you can change. Yet, a good start is a good start.